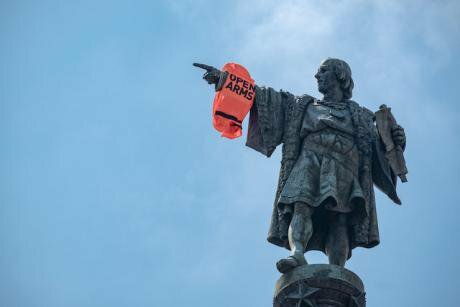 Life jacket hung on Christopher Columbus monument in Barcelona as Oscar Camps, founder of Spanish ngo specialising in search and rescue at sea and Ada Colau, Mayor of Barcelona, attend press conference, July 4, 2018. Paco Freire/Press Association. All rights reserved. Invited to speak on migration and Brexit by Agora Europe, there is one idea worth exploring in more detail, that I have been mulling over since I interviewed Carlos Delclos a social movement expert and activist based in Barcelona, in 2016. And in June 2015, Ada Colau, PAH’s former founder and spokeswoman became Mayor of Barcelona, where she now runs a worldwide hub of connected ‘fearless cities’ –crossing national and continental boundaries, on a bigger scale, but still living together: for one another. Why go on about this ‘signature action’ now much overtaken by events? It’s all rather simple at one level. The mutuality of it, its egalitarian nature, is refreshing: this is not setting out to ‘help migrants’ in the more familiar unidirectional way. And in that regard it is worth noting that this is something it has in common with conflict resolution processes designed to overcome enemy images. I recently contrasted ‘safe spaces’ in the Irish ‘troubles’, where Protestants and Catholics met each other to explore ways out of violent conflict, with what goes by the name of ‘a safe space’ now. The same was true of those conflict resolution spaces: whatever the power imbalances between the parties, and regardless of the conflict raging outside, for the duration those present were equal. As decades of research into racial prejudice have shown, the most powerful way to get people to stop demonizing each other is to introduce them to one another. PAH too was a ‘contact sport’ in this regard. Sheer face-to-face contact and reciprocal solidarity allowed PAH activists of various kinds and class backgrounds to supersede Them and Us divides. It did this as well through complicating the narrative and widening the lens for all concerned, so that people who came in with an individual problem could soon see that they were part of a much wider picture. Contrast this process of “direct citizen involvement” – its horizontal self-empowerment, its particular way of scaling up from the mobilised individual across borders and boundaries to achieve “largescale success” – with a very different way of constructing political community, which is the monocultural National Us. In particular I am thinking about how in country after country, in Europe and elsewhere, under the leadership of nationalists and xenophobes, we can see the emergence of aggrieved majorities, encouraged by their political representatives to perceive themselves as the “real people”, the ‘National Us’, unfairly victimised by some Other – let us say a few thousand migrants destitute on European shores whose arrival has triggered a major political crisis throughout the European Union. It seems as if a few desperate migrants are the only identity-forming ingredient required to construct this exacerbated or aggrieved majoritarianism on a major scale. The “real people” routinely get the numbers and impact of “the threat” wildly wrong, as they do the proportion of Muslims in the UK and elsewhere… but this is all part of the essential feature of this type of identification. At its core there is a hyperbolic, aggrandizing function – present, you could say, in direct proportion to the sense of political impotence and humiliation of those who benefit from such an imagined community. And what it takes to seal the deal with a national populist leader is an enemy image that allows the ‘National Us’ to feel simultaneously superior and under threat. Note too that this is not a sense of community predicated on citizen involvement. It has its activists to be sure. But it is first and foremost an experience within identity politics, an identification with a larger power that people who may feel humiliated, powerless or meaningless need to make personal sense of their lives. And it does this primarily by making them feel bigger than they are. Indeed the examples I can think of are often associated with the ‘People’s will’, a unitary category without internal disagreement that is deemed to represent and unite the “real people” of a nation, as opposed to “the others” in so many of our countries today. - or, more usual and taken for granted today, it could be an aggrieved and exacerbated majoritarianism – the fiction rising up in our midst, invariably encouraged by certain types of leaders, of a unitary “real people” over and against the “others”. By contrast to the Barcelona conflict resolution effect, these identifications are proliferating machines for enemy images, and en route to violence. Take the UK. There has been ongoing debate about how much the nostalgic element of the Brexit vote owed to nationalism and how much to empire. Anthony Barnett’s The Lure of Greatness; England’s Brexit and America’s Trump roots his explanation in a neat hybrid of the two, which, as it happens, adds a further variation on the type of aggrandizing hyperbole to those concerning us here. This is the author’s longstanding warning that England’s loss of faith in the once-glorious British project could become an enormously disruptive force, if the UK’s “long drawn-out constitutional and political impasse” is not resolved in a progressive way. Here it is the identification with nationhood made even more glorious by empire, that promises collective meaning in particular to English individuals who in themselves, for whatever reason – manufacturing decline, financial crash, globalisation, incomplete UK devolution – have no adequate means of democratic self-expression. A long-gestating series of rebuffs to the monocultural National Us from austerity to superdiversity, has led to a Brexit vote determined to “take back control”, on a wholly unanticipated tidal wave of humiliation. Weale is most concerned by the populist undermining of representative democracy, warning that the populist error that democracy means direct determination of government policy by the people all too often has the “paradoxical effect” of putting more power into the hands of the executive. Where Weale and I wholeheartedly agree is that at that moment, the democratic principle that “democracy is an institutionalised debate in which competing views are expressed within a set of rules” – is simply extinguished. But my interest here is in the hyperbolic or aggrandizing impact of this identification process on millions of people, whereby a slim advantage in a binary referendum immediately has conferred upon it the status of the will of the whole people, erasing all self-questioning, internal diversity, opposition or further debate. None of us will forget the incessant repetition of the phrase, “Brexit means Brexit”. Over two years later, when it is regrettably abundantly clear that nobody knows what Brexit means, we have gradually gathered what that phrase is really saying, in direct proportion to the lack of democratic articulation – “We don’t have to spell it out, but We Know Who We Are”. - lack of interest in diversity in its own ranks. So in Brexit Britain, we are seeing two such formations squaring off and in the process, pulling what is left of our democracy in the UK apart. Both are in these few important respects, mirror images of each other. In this type of majoritarianism, crucially, we hear very little about the respect for minorities that has always been held to be a litmus test for a healthy democracy; and very little of the need to reach accommodation with opposing views. Instead we hear much more about a strength in numbers – for example the call for a second referendum vote to ‘stop Brexit’ in its tracks, which seems to have succeeded at least temporarily in helping to reverse the 52% versus 48 % in the opposite direction. The latest independent poll result dramatically unveiled in the culmination of Channel 4’s Brexit debate told us that we now stand at 46% leave to 54% remain. Unfortunately for our ever more deeply polarised nation, the concept of winning is still about force, whether of strong men or sheer strength in numbers. It is never about listening, let alone persuasion. By extension, it shuns both non-institutionalised and institutionalised forms of debate. Yet in the digital communications era, that fragmented era that leftists tend to mourn rather than set out to shape, aggrieved majoritarianism becomes a use of force potentially as lethal and divisive as identification with the strong man, or lone wolf identification with the nation. Its proliferating enemy images can lead to violence, as we learned so early on in this process, with the tragic murder of Jo Cox MP. We need something else. My point is this. The really crucial feature of the PAH exercise, which became the 15M of the indignados, and brought Ada Colau to power, was that people in those horizontal movements of the squares learned to work across boundaries with the Other and other others, to achieve what they could do together; without these hyperbolic identifications which for a while persuade us that, united in our resolve, we constitute a single, unitary indomitable National Us. In the process, by comparison, people are cut down to size and returned to their own stature as highly diverse human beings, only to be mutually raised into empowerment by working together. Adapted for our communications age, this understanding of empowerment, the creation of a transformational agency through political interaction that we once called ‘people power’, may be the main if not the sole advantage that the left has today over and above the much readier balloonings of identification accompanying the rise of proto-neofascist “real peoples” in our midst. In the unseemly race to the bottom that is the game of winning and losing, Them and Us, how have we forgotten that all good relationships are predicated on mutual vulnerability not force, whether we are talking about conversation, friendship, love or community? The answer of course is fear, fears happily engendered in us by a political class in systemic crisis. As Bolsonaro takes over Brazil with 55% of the vote, his euphemistically-described ‘conservative policies’, economic liberalism and out and out violence, we see him joining Trump in moving the Brazilian embassy in Israel to Jerusalem, on the same day that Trump threatens to send 15,000 troops – a number roughly equivalent to the size of the US military presence in Afghanistan – to the US-Mexico border, whipping up vigilanteism through the fear of "invasion". Bannonite leaders cannot thrive in societies that are confident about crossing borders, and this is something that they understood very well some time ago. No democrat, left or right, can afford not to think about the implications of this for our democracies. And we are not just talking about weaponising physical borders. The clients of Cambridge Analytica and their ilk are willing to deploy predictive algorithms, psychometric messaging, with every intention of finishing democracy off. They do this through the calculated aggravation of prejudice leading to the proliferation of enemy images and toxic polarisation. As Alan Finlayson pointed out in his article on Brexitism (LRB) in May, 2017, the politics of continuing referendums and recalls such men advocate are also aimed at stalling action by elected politicians and public service professionals alike, to leave the way clear for “a new kind of nihilistic governmentality”, where the ebb and flow of mood and opinion in big data can be surfed and any useful wave amplified, ballooned and capitalized upon. The evidence is gathering and has hardly been hidden for quite some time. Aaron Banks after all, did spell out for us his “very simple agenda: to destroy the professional politician”. So we on the left need to seize every opportunity to cultivate constructive and confident encounters with the Other. Much more than Vote we need Voice, and parliamentarians dedicated to guaranteeing inclusive, open democratic debate: we need a People’s Debate that can bring leavers and remainers together across the borders and barriers of age, class, race, geography, nation and ability, in the opening act of a historic and transformative process of citizen empowerment.